We arrived in Quito, exhausted but feeling really good about our amazing Galapagos adventures, said goodbye to our new found friends, grabbed our luggage and stepped out of the secure area at Quito International. Still a little dazed by it all, we were quickly snapped back to reality as the most friendly Ecuadoran driver named Juan Pablo (not THAT Juan Pablo from The Bachelor—this one is Ecuadorian and was really good guy!) scurried up to us with a sign that said SVOBODA…and we were off on our next big adventure. We headed to the Hacienda La Alegria and spent an hour driving south. It was dark when we arrived, and several dark shapes came rushing forward as we exited the car. Wagging tails, furry bodies, and cold, wet noses surrounded us. 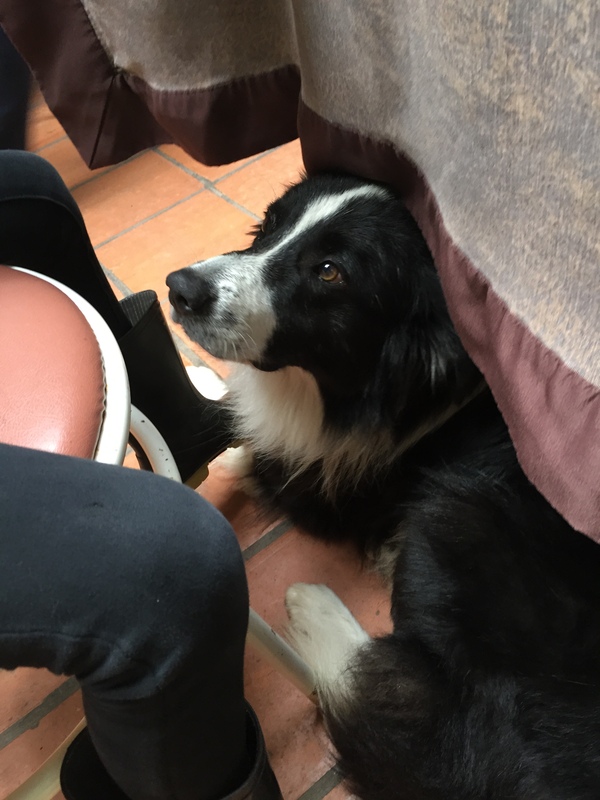 We received our first welcomes to the hacienda from the five resident dogs ranging from Border Collies to a geriatric German shepherd, named Jessica. Oreo (black/white Border collie) was the leader of the pack and kept the rest in line by making sure that he got his attention and loving from the girls first! The girls had a wonderful time playing with them all. My favorite was Sultan—a friendly Border collie mix. The ranch had 100+ horses, cows, sheep, llamas, alpacas, chickens and bunnies. Jessica seemed to be the chief bunny watcher—we weren’t sure if she was protecting or coveting them. We slept well that night and rose early the next morning for breakfast, selected our equipment, saddled up our horses, and headed for the hills. There were six people and seven horses—our family of four and Gabriel, the owner of the hacienda, and Rodrigo, the horse wrangler. There was one extra horse that carried the packs of lunch/snacks and overnight bags. 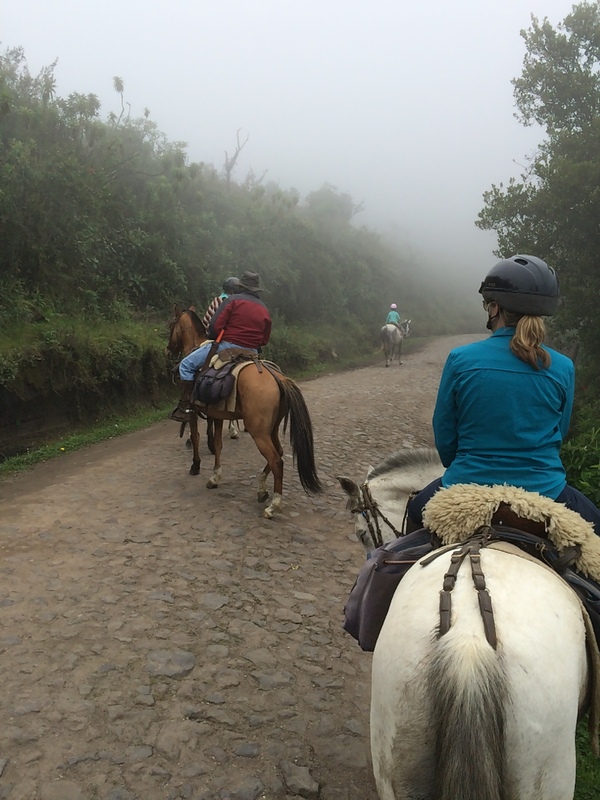 The goal was to reach the Cloud Forest located at 12,000 feet by late afternoon—around 5-6 hours of riding. Let me begin by saying, Jared and I both like to ride horses and have some experience. 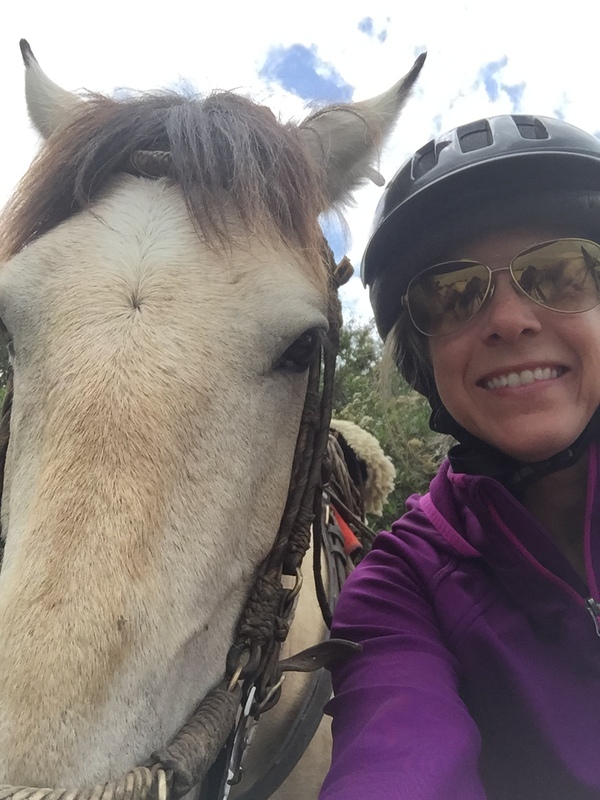 We typically ride a couple of times a year on vacation and spent a week riding at a dude ranch in Colorado a couple of years ago—so we do have some horse time—mostly walking, a little bit of trotting, and very little cantering/galloping. 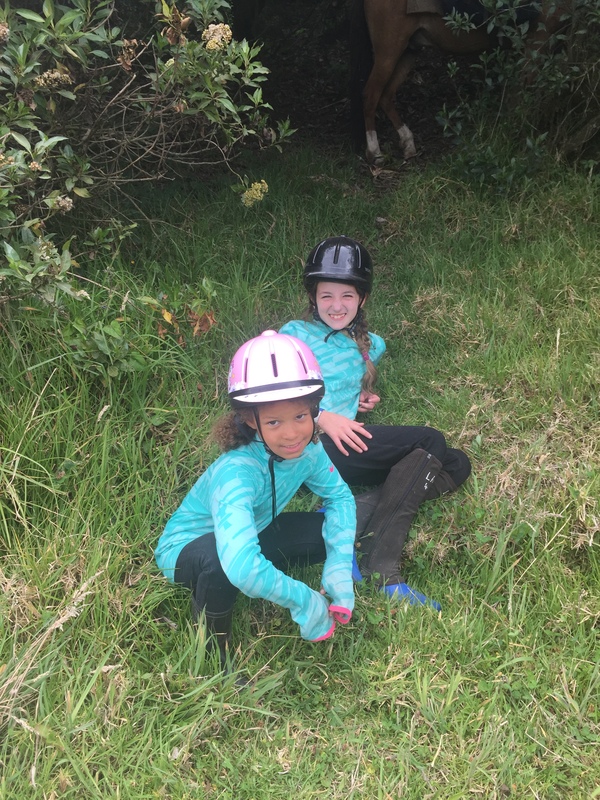 Let’s contrast this level of riding with Lilli and Isabella, who both ride weekly and have done so for a few years and practice walking, trotting, and cantering regularly. We started off the ride with Isabella setting the pace—and those of you who know her–she only has two speeds—fast and faster. We did more galloping/cantering in the first hour of the ride than Jared and I had done in our entire lives! It was scary, painful, and humbling. We had five more hours to go and I did my best to not complain and keep up—but to be honest—I was miserable for a good chunk of the ride—I was scared every time we started riding fast, my helmet slipped forward on my forehead when we went faster than a walk, and the my position in the pack towards the back ensured I was riding in a cloud of dust on the dry side of the mountain–which clouded my vision, made it hard to breathe, and added to my general misery. Ok, enough of the Kim pity party—let’s get back to the story: Much of the ride at the beginning was on rough, old blacktop roads that turned into brick and cobblestones and on a steep incline. The horses knew what they were doing and were very sure-footed. 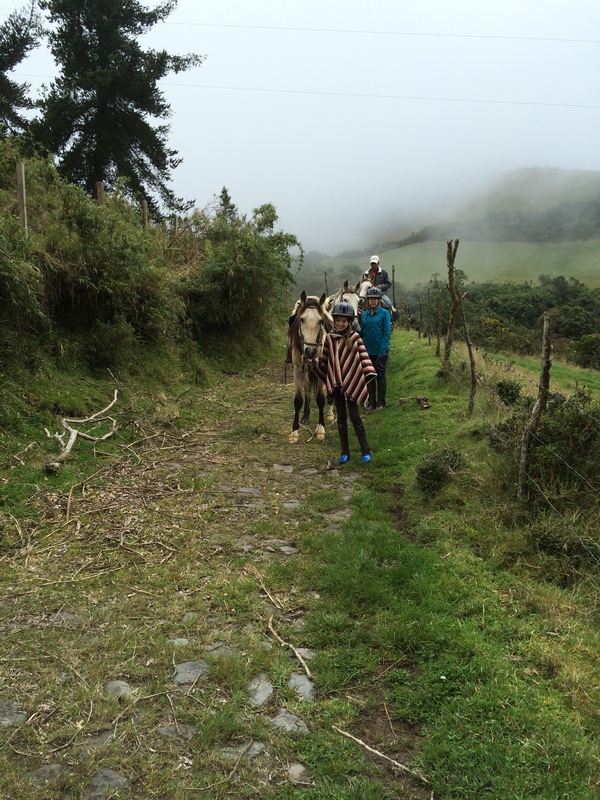 The blazing saddles speed slowed down once we entered the cloud forest and we walked because it was safer for the horses—thank goodness! Jared held up better with his strong marathon runner legs and held onto the horse during our galloping and trotting sessions. The scenery ranged from a small country town, fields of potato plants, corn, and other vegetables, and finally the mucky mud trail through the rainforest—full of lush trees, tropical plants, and beautiful flora. Gabriel and Rodrigo took turns hacking through the forest with machetes–it had been a month since they had last taken the route and the jungle quickly worked to reclaim its territory. While we rode, the pack horse followed along freely, unless we were in an area with cars/trucks or the horse needed guidance. 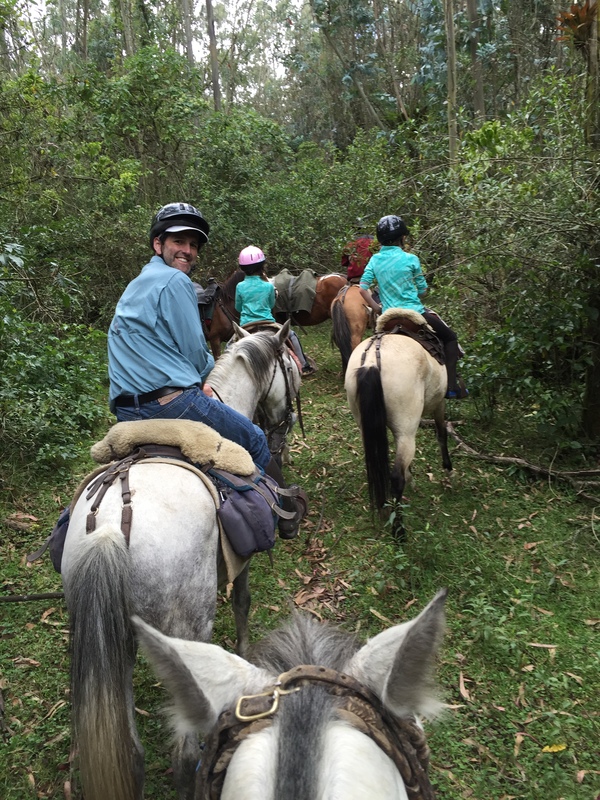 At one point during the ride, both Gabriel and Rodrigo were trying to grab the young horse’s reins and missed. As it slyly maneuvered around stumps and trees just out of reach of our guides, the pack horse passed by Isabella’s horse. She quickly reached out, grabbed the reins, and brought the horse under control in one swift motion. Gabriel’s eyes were wide as he watched it happen and we all laughed. If you need the job done, send in Bella. Along the trail we saw different wildlife– first many of dogs: the joke in Ecuador is that every house has five dogs. I am not sure it is a joke—it seems to be true. The dogs did a good job announcing our presence as we rode through their neighborhoods—some a little more boisterously than others. A few dogs chased as well. The horses didn’t like the chasers much and it definitely put a pep in their step to get away from the little loud animal at their heels. Next we saw livestock—mostly cows, some llamas/alpacas, sheep, horses, donkeys, and goats. The animals were typically tied to a pole or fence and left there to graze with their owner likely not too far away. At one point we had an alpaca trying to join our group. He had made his escape and was looking for some fun—-he still had the incriminating rope tied to his neck with the frayed edge dragging on the ground behind him. We saw many birds as well and could hear them along the way. At one point, we saw a dead fox on the trail—not sure what happened to him. The foxes in Ecuador actually look more like coyotes—with very long legs. The Hacienda in the cloud forest was a tiny one story building built into the side of a hill. It had no heat other than the fireplace and only had hot running water for a few hours in the morning. A large propane tank and small generator was its only source of energy, other than the pile of chopped wood neatly stacked next to the house for the fireplaces. I think it was the second or third place we stayed that did not have a regular heat source and this was the first place that didn’t have a heat source that the temperature dropped down to about 8-10 degrees Celsius (about 45-50 F). Brrr! We spent the early evening sitting by the fire and listening to the gentle sound of the rain on the roof. Then as we headed to bed our hostess gave us each a hot water bottle to take to bed with us. I had not realized how important this would be until we climbed into our cold beds. We woke up the next morning to a wonderful homemade breakfast—lots of baked goods, homemade jams, eggs, pancakes, all wonderful! 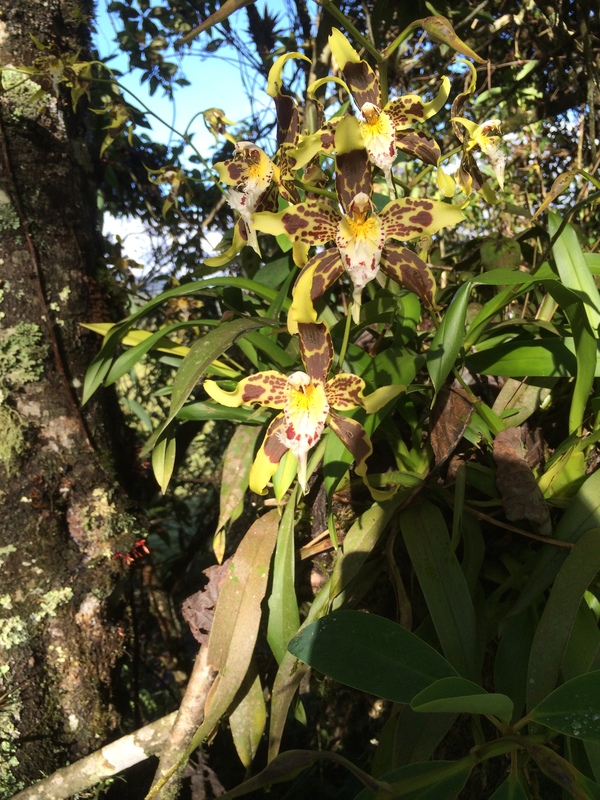 After breakfast were given a grand tour of the beautiful and expansive orchid garden cultivated for the past thirty years by the family patriarch, Ernesto—it was truly amazing and obviously a work of love. 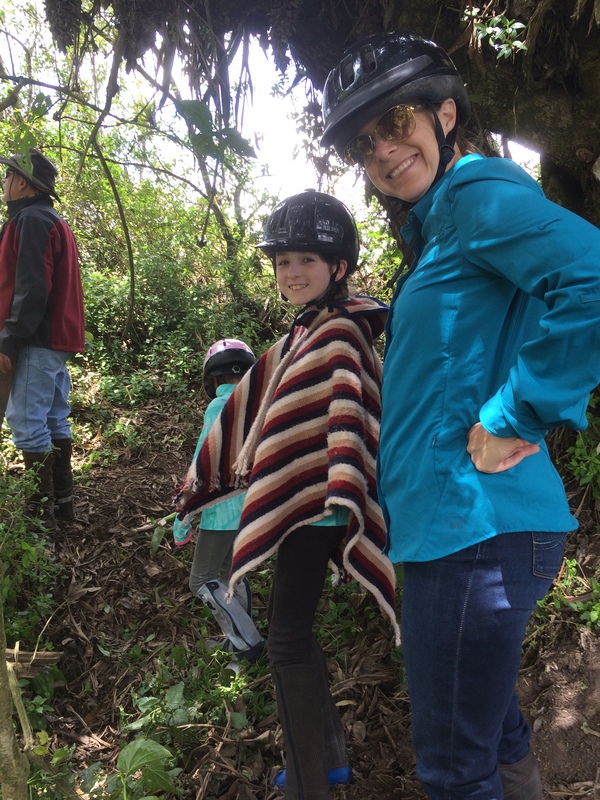 We saddled up and climbed back onto our horses and rode back the same way we came through the rainforest, up and over the mountain, and eventually through the small country town. 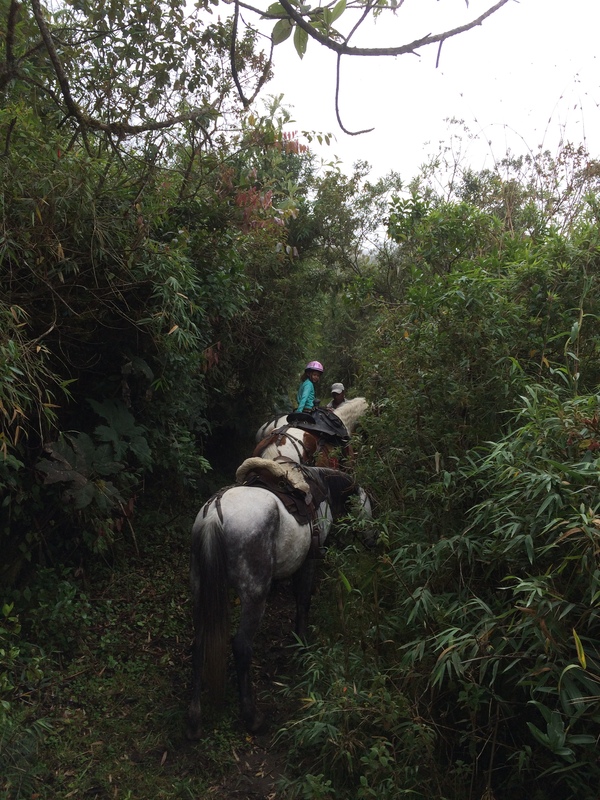 As we started the final stretch down the long driveway of Hacienda La Alegria I think my horse was as tired of me as I was of riding and started this incredibly fast gallop down the driveway. As I was trying to slow him down-both Gabriel and Rodrigo came along either side of me and got the horse calmed down immediately. 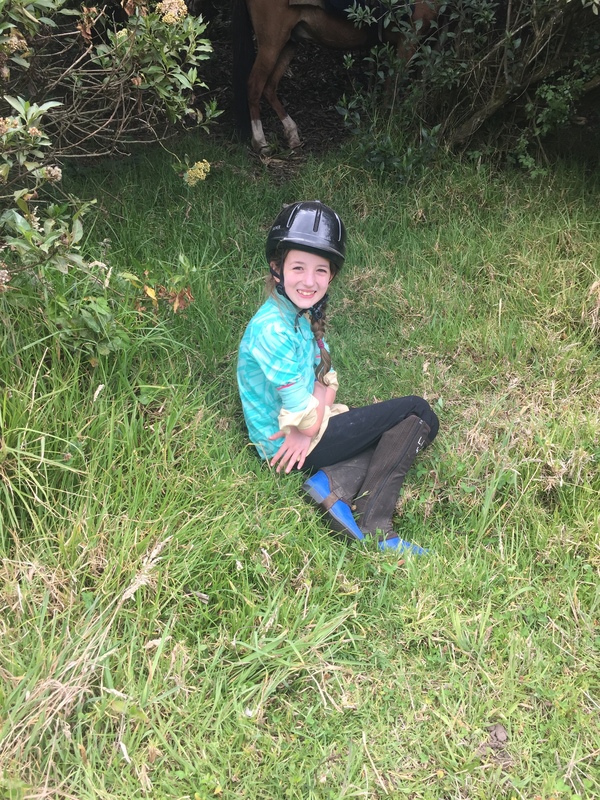 We made it back to the stable without further incident and I gratefully slid off my horse and limped slowly away from him as I regained the use of my walking legs. Gabriel’s cousin was there to greet us and he took one look at me and asked if we needed a beer—to which we both answered “yes”! 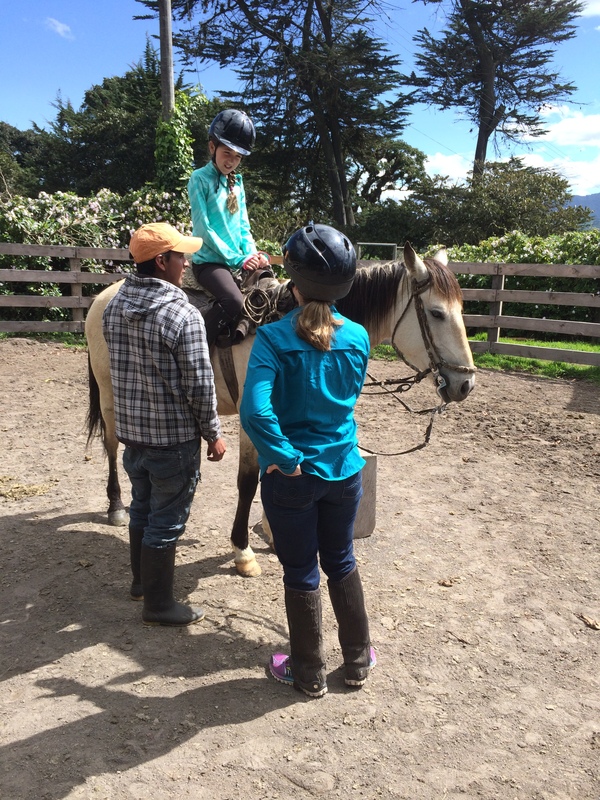 After lunch, the girls rode the ranch’s Paso Fino horse, he was beautiful to watch and Lilli and Bella both enjoyed trotting him around the large pasture. 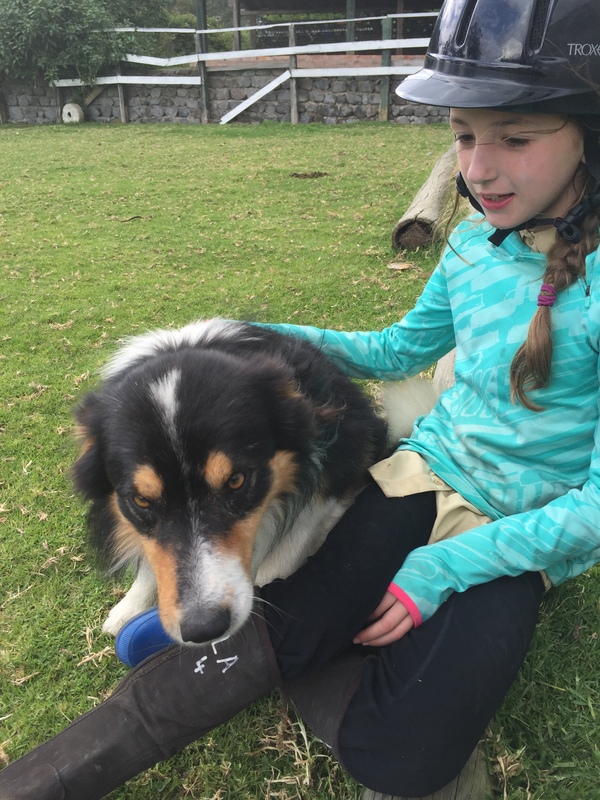 Though we had ridden a total of 11-1/2 hours in the past two days, the girls couldn’t get enough and spent more than an hour riding the Paso Fino and enjoying the company of the Border Collies running around the pasture. We were all happy to get to bed that night, but we knew it would be a short one. Our flight from Quito to Miami and then onto Chicago the next morning was at 7am, which meant a wakeup time of 3:30am. We were glad to head home for a 4 day layover to unpack and repack and head to beautiful Sydney, Australia! Read our next post to hear about all of the fun things we did in Australia and New Zealand. LOVED IT THERE!